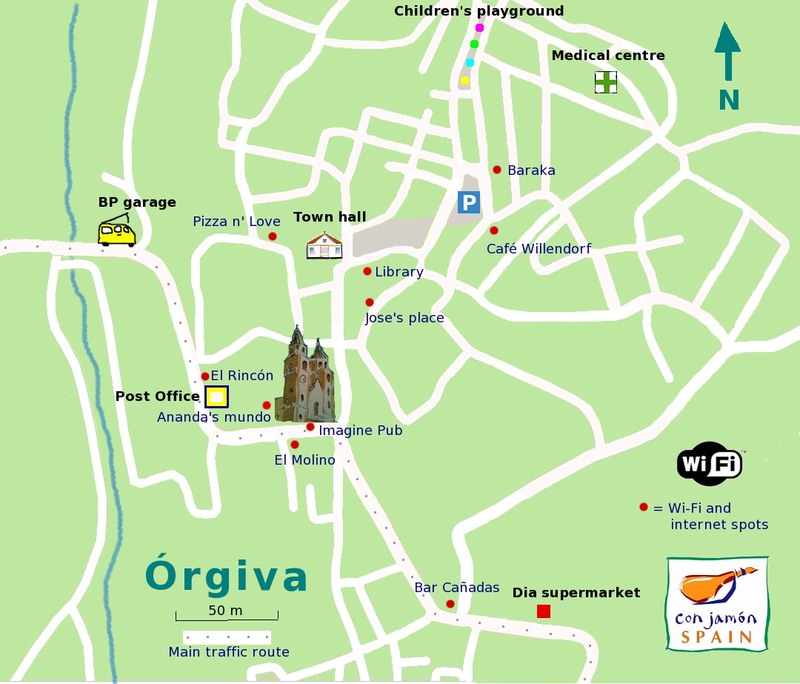 There are several places that have decent, free Wi-Fi (pronounced wee-fee) in Órgiva. Of course, the places appreciate you buy at least a coffee or beer. Just ask them for the password. Near El Viejo Molino there’s an electrical shop and also a couple of mobile phone places selling adapters and cables. This bar – on a corner just up from Dia supermarket at the southern part of town – has good Wi-Fi although you sometimes have to ask for them to turn it on! It also has a great helados selection to help cool you down – and you can play a game of pool. Open every day from 7.30am until 11.30pm (closed Sundays). Av de González Robles, 67. This hotel and bar is just after the bridge on the left as you leave south from Órgiva. It’s a lovely spot to surf and enjoy a drink among the plants. Open every day from 9am to 11pm. Avda Gonzales Robles. El Viejo Molino‘s trump card is the open inner courtyard. There are about 20 tables so it’s normally easy to settle down – the tables near El Comedor in the corner have the best Wi-Fi signal – although it’s not brilliant. The tapa is decent. Open every day (except Wednesdays between mid-October and March) from 9am til late. Avda Gonzales Robles. Again, near the weekly market, Baraka is a chilled-out and comfortable place serving great food. Internet access is via cable to your computer – not Wi-Fi (so can’t use other devices on Wi-Fi). Open every day from noon to 11.30pm (except Thursdays, 9.00am to 4.30pm). Closed Fridays. Calle Estacion n12. This bar is on the upper level of the indoor market just off the main square (Plaza Alpujarra). Plenty of tables and good access if you’re disabled. Open every day (except Sundays) from 10am until 9pm. Tucked away near the town hall, this is the latest incarnation of a place in search of an identity. It was once Café Libertad and more recently a tapas bar. Now it’s a cute, modern bar/restaurant with pretty good Wi-Fi, including from the tables outside in the narrow street. Open everyday from 7pm (closed Tuesdays). Calle Libertad. Near the weekly market, Café Willendorf is a decent, dark bar with loads of tables, so easy to tuck yourself away in a corner. It lacks a little soul perhaps and the Wi-Fi isn’t so good on the outside tables, but inside, it’s great. Open every day: Monday to Friday from 7.30am, Saturday from 9am, Sunday from 3pm. Calle Miguel de Cervantes. The library on the main square has internet, as does a telecommunications place (we’ve dubbed Jose’s place – it’s actually called RadioCable) in a side street up from the church. Ananda’s mundo behind the church also has paid-for internet access. El Rincón, next to the Post Office, has Wi-Fi too. Outside of town on the way to Motril/Málaga before the bridge are Hotel Taray and Camping Órgiva. Both have free Wi-Fi and good food. Hi – does the library in Orgiva allow visitors to plug their own laptop into the mains and access the internet wirelessly? If so, do you know how common this is in towns of the area? Are there many libraries with wi-fi? Hi Woody – we doubt the (only) library has Wi-Fi but there are places that, if you ask nicely, you can plug in your laptop and either connect directly to the internet via the ethernet cables provided (eg Baraka), highly recommended) or to use the Wi-Fi, eg El Molino and many other bars around town. Hope that answers the question.